How To Show Last Updated Date In WordPress Posts? Bingo! It is one of the most important things about blogging. Because displaying and presenting the most updated information to the readers or visitors of your blog or website should the primary key point of any website or blog. In this way readers or visitors are satisfied that they are reading the most updated information in the article to the date and not any stale stuff, which may not be relevant at the given time. It’s true that not all WordPress theme has the feature by default, like my theme does not have this feature to be honest, but this can be done by modifying the theme code a little bit (Only for advanced users with some knowledge about PHP and not recommended for all). A few days ago I myself, was looking for an appropriate solution for the purpose. But unfortunately I could not find any relevant result. Only some reference of obsolete and buggy codes which I found. So in this article I wish to show the most recent and working solution about “How To Show Last Updated Date In WordPress Posts” while keeping the Published Date untouched. Did you know, Google Set to Name and Shame Sites Lacking HTTPS? Chrome Browser Will Flag Sites Lacking Security Communication Protocol. Many famous websites and blogs don’t even show any date on their articles. This is a very bad practice and you should never remove dates from your articles or modify to a new recent date to prove updated. The methods I will be showing below will only be applicable for Posts and NOT for Pages. I am mentioning this line because the other codes available automatically adds to the pages too, resulting a broken site. Which is simply not desired. Until yesterday I was using the second method while a friend of mine, Sayan Datta created this New much waited WP Last Modified Info Plugin through which showing updated date, time, on pages, posts, also adding ‘dateModified’ schema markup data automatically which surely adds value to SEO, customization of text, date format, colors and everything is now possible just setting up with the click of a button. No need to know coding. Allows you to display Last modified information in your posts and pages individually. Provides you with options to display the last modified/last updated date above or below your posts and pages. You can also set date/time formats and the position of the timestamp in WordPress Posts and Pages which can be either before content or after the content. Allows you to customize the text which is to be displayed alongside the last modified date (default: Last updated On). Inserts ‘dateModified’ schema markup to your WordPress posts automatically. Allows you to display last modified info on all post types column and publish meta box in the dashboard with the author name. Allows you to sort posts/pages in last updated/modified date time order. Allows you to display last modified info on your post as human readable format, i.e. Days/weeks/months/years ago. 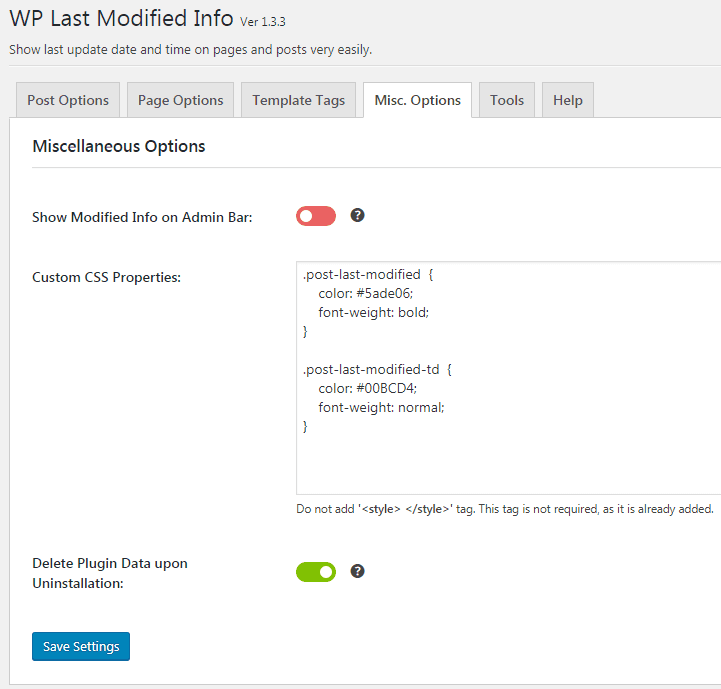 Allows you to display last modified info of all posts in the WordPress admin bar. Allows you to display last modified author info in posts, pages. Allows you to add last modified timestamp in post/page’s custom field. Allows you to edit last modified date and time from the post edit screen and quick edit screen also. You can also add template tags to your theme files. Go to the FAQ section for more information. And you can customize all and everything. First simply install the plugin from WordPress Repository WP Last Modified Info Plugin. Now in the settings page customize the options as per your need through post options, page options. Only if you want to add custom style to the text you can simply add the following format in the custom css box of the plugin as shown below. So we are done with the most simple option to add updated or modified date and time with any themes or custom WordPress setup! This is a very unique approach because it shows the age of your post, while also letting your readers know that you’ve recently updated it or not. Now, for this method, we just need to do is add a Code Snippet to your WordPress site. You can simply add this code snippet directly to the functions.php file in the child theme, but I suggest using the Free Code Snippets plugin since it makes things easy and prevent you to make less messy things. Also if you change theme at any time, you don’t have to worry about that. After installing Code Snippet Plugin, navigate to “Add New” section and add the following code. Please feel free to change the style colors as per your theme design. Then give it a tittle name and select “Only run on site front-end” option on the view-port. Take a look on 14 Best WordPress Page Builder That Cut Out Coding. Sounds interesting, huh? No need to learn coding and all technicalities. Just start and put your blog live in minutes! With this method you will be able to display the post published date, updated date and the time all together just using another Free Last Modified Timestamp plugin. You just need to install the plugin and place the [last-modified] in the beginning of any article you wish to show the updated date and time. Note: Remember that by using Last Modified Timestamp plugin you have add the code snippet manually for every single article or post. Wow! That was fast, but believe me it took hours to find the correct code with result with the help of my friend. Thanks to him as well! Heads up! For this method you need to edit specific WordPress theme files. There are many WordPress themes available who now use their own template tags which define how these themes show post meta data like date and time. So be very careful about this one. As I have mentioned before that you need to have some PHP knowledge to go for this method. Always remember to take backups whatever you do! Read More: Function Reference/the modified time from WordPress Codex. To do this you need to look for the codes and hooks responsible for displaying the date and time. Just replace that code with the following code, or add it right after your theme’s date and time code. So by now we have a clear picture about which method one should deploy for their website or blog. On a personal note, I prefer the first method Show Last Modified Date And Published Date Together with WP Last Modified Info Plugin as it provides information both about published date and modified or updated date. In this way the readers or users will have more specific queries for what they are looking for. Like in my case I simply applied the first method by adding the plugin and customized as per my need. If you want use the other options you are free to use. But I always recommend to go for WP Last Modified Info Plugin or if you want to test the other methods then DO take backup every time. Whether you are working live or on a staging environment. Feel free to share with me if you have implemented any of these methods. I will be more than happy to learn from you. Thanks for your compliments! I hope you will enjoy reading and visiting my site in future too. Regarding the design, well I myself is a Visual Communication Designer (You can read in my about section) and all designs and artworks and everything is done by me only. So any other designer was not required. Thanks you. if this is truly the best place to ask but do you folks have any idea where to get some professional writers? Hi, thanks for your kind words. Well I write my articles myself. But you can search for professional article writers anywhere, just Google it with your location. so you get the best prices also! Cheers! Thanks for your post, it is very easy to understand..
First of all thanks for your nice words of appreciation. Now, as you have mentioned that why not write for those well known information based websites, well as a matter of fact I don’t want to write as of now on any other platform as I don’t want my articles to go through some weird moderation process by some God Knows who! Please do not think I am against these platforms, not at all if you read my “About Me” section you will understand that I clearly differ from many of the ideas of these giants and I need my own platform, so that I have created my website. Rest for the “Fame and Name” part it’s fine with me as that is not my goal anyway, if people like you are reading my articles (and do comment if you think something is not right or I should change my view, I always welcome positive and constructive criticism) and liking it, what’s more one can ask for? I am happy with it. In future if I feel or get an option to write or publish my articles with other platforms, I will surely do that but on my count. Hope you understand that. Thanks again for asking this question! Great article, a question like how you insert this kind of text boxes with the “Read more” button in your message, through abbreviated code or some plugins? you would recommend me some. It’s totally custom made by me, and no plugins at all. Of course, I use normal html and css codes. That’s it! Great to know you liked it! Thank you. Excellent, I’ll try to create something similar with just CSS and HTML. using a TinyMCE button in the WordPress editor. Thanks for the information, I thought you were using some plugins. Thanks Michelle, hope you will find other articles useful too. I will let know Sayan! Great work and useful information! Thanks for your feedback! Hope our site will help you more in future!